The Catatumbo Lightning (Spanish Relámpago del Catatumbo) is an atmospheric phenomenon in Venezuela. It occurs only over the mouth of the Catatumbo River where it empties into Lake Maracaibo. The frequent, powerful flashes of lightning over this relatively small area are considered to be the World's largest single generator of tropospheric ozone. It originates from a mass of storm clouds at a height of more than 5 km, and occurs during 140 to 160 nights a year, 10 hours per day and up to 280 times per hour. It occurs over and around Lake Maracaibo, typically over the bog area formed where the Catatumbo River flows into the lake. 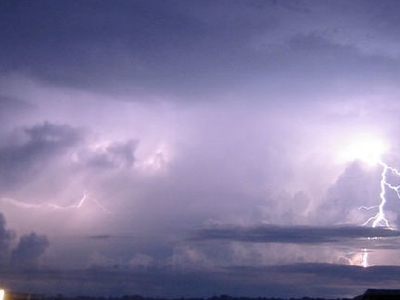 After appearing continually for centuries, the lightning ceased from January to April 2010, apparently due to drought. This raised fears that it might have been extinguished permanently. The phenomenon reappeared after several months. The Catatumbo lightning usually develops between the coordinates 8°30′N 71°0′W﻿ / ﻿8.500°N 71.000°W﻿ / 8.500; -71.000 and 9°45′N 73°0′W﻿ / ﻿9.750°N 73.000°W﻿ / 9.750; -73.000. The storms (and associated lightning) are likely the result of the winds blowing across the Maracaibo Lake and surrounding swampy plains. These air masses inevitably meet the high mountain ridges of the Andes, the Perijá Mountains (3,750 m), and Mérida's Cordillera, enclosing the plain from three sides. The heat and moisture collected across the plains creates electrical charges and, as the air masses are destabilized at the mountain ridges, result in almost continual thunderstorm activity. The phenomenon is characterized by almost continuous lightning, mostly within the clouds, which is produced in a large vertical development of clouds that form large electric arcs between 2 and 10 km in height (or more). The lightning tends to start approximately one hour after dusk.